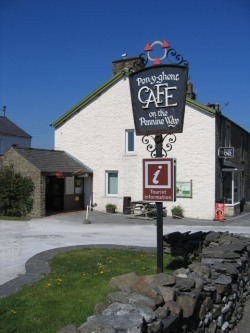 The Pen-y-ghent Cafe has been the starting point of the the Yorkshire 3 Peaks Walk for many people over the years. The café operates a clock-in/out system to time, and aid the safety of walkers. A clock card machine records the start and end time of walkers. Those completing within a 12 hour period are invited to join the Café's 'Three Peaks of Yorkshire Club'. Many people prefer to start the circular walk at other points to avoid the early morning crowds in Horton-in-Ribblesdale & up the first ascent and instead stop at the Café for lunch or a much needed break. The staff in the café will create a card for your return, and will wait after closing time until everyone has returned. Should you not complete the walk or not return to the Café for any reason it is very important that you ring (01729 860333) to prevent a search party! Please Note: horton-in-ribblesdale.com is not affiliated with the Pen-y-ghent Cafe.